I am writing to thank the supporters of the Come Before Winter women’s retreat. I can say without prejudice, that it is the BEST CHRISTIAN SEMINAR OR WORKSHOP that I have ever attended, and I have attended many in my Christian life of over 40 years. Our group of 8 ladies from Tomsk, Russia, (3 American missionaries and 5 Russian young ladies) was privileged to attend the retreat in Novosibirsk, Russia, this past spring. I can say that it was a wonderful, personal renewal for me, and I believe for the other women as well. But it has had much greater and far reaching consequences than that. The method of study which we learned at the retreat has been put into action and has rejuvenated many of the small groups which meet within our congregation here in Tomsk. Our group which attended the retreat came back and met each week to continue studying passages in Mark together. 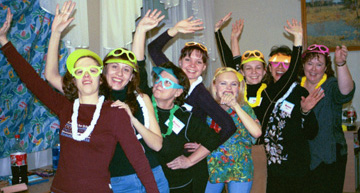 The Russian young ladies, who are small group leaders, began this method of study within their respective small groups. In fact, one young lady was called upon to teach another small group, which had not had a leader to attend the retreat. Our communication with Karen Alexander, (we would e-mail her our Core Sentences and Monday Meanings or life applications) spawned her idea to begin a study group through the Internet. We are beginning a study of Matthew, using the method of study which we learned in the CBW retreat. We are very excited to begin sharing with other Christians from around the world. We feel it appropriate to thank those who helped make all this possible with generous donations to the CBW program. We would encourage you to continue in this good work, so that many other sisters in other nations will have the same opportunity which has meant so much to us personally and to our congregation as a whole. Thank you very much.